Feeding regimes used in commercial fish farming have a considerable influence on the efficiency of production. Feed represents a large part of the cost on intensive rearing, thus the rational management of feeding is essential to ensure profitability, which means maximum growth at minimum cost (Talbot et al., 1999; Hewett and Kraft, 1993). Therefore, economically balanced new feed sources should be found and extended to the aquaculture industry (Lim and Dominy, 1990). In the foreseeable future, world fish farming will increase, whereas natural fish resources in many places are being overexploited. The need to make better use of available resources seems logical. In this respect, one of the available resources, by-catch from the fishing industry should receive priority, particularly in local aquaculture industry. The anchovy (Engraulis encrasicolus L.) is the first ranked fish species captured from the Black Sea. According to the annual fishery statistics of Turkey in 1997, total landings of anchovy was 241.000 metric tons and represents 48 % of annual fishery production of the country (Anonymous, 1998). It has been consumed, mainly, as fresh and canned, and also processed as fish meal. The Black Sea has recently received increasing priority in rainbow trout culture, particularly in the last decade. However, the period of January, February and March is the coldest season in a year in Black Sea. During this period, the rainbow trout loses appetite since water temperature drastically drops below optimum culture conditions (Edwards, 1978; Çelikkale, 1994). The capture of the anchovy in Black Sea also ranks during the same period, and some of the captured fish are discarded because of untargeted smaller fish size which is not possible to utilize for human consumption. But this kind of discarded bycatch fish may be evaluated as a potential feed for aquaculture. Fish or some other sea products have already been used as wet feed in fish nutrition. Grave et. al. (Grave et al., 1979) pointed out that the rainbow trout fed mussel and/or krill showed better FCR, and that wet feed had positive effect on the health of the fish than the fed dry pellet. Berge and Austreng (1989) demonstrated that the use of raw mussel in feed of rainbow trout was more effective than pellet in terms of economical aspects. Aral et. al. (1999) confirmed that wet feed such as mussel could be used in feeding of rainbow trout to decrease the production cost without any negative effect on growth. Gabrielsen and Austreng (1998) pointed out that in certain places where there is an abundance of marine offal, the use of wet feed in aquaculture will increase the profit margins. The rainbow trout, approximately weighing an average of 100 g body weigh (BW) were transported from a land-based commercial fish farm (fresh water) to experimental net pen culture unit of Fisheries Faculty, Ondokuz Mayis University, Sinop, Turkey (brackish water with the salinity of 16-18 ppm), and acclimated with commercial trout diet to the new rearing conditions for one week prior to the experiment. At the beginning of the experiment the fish were randomly stocked (100 fish/net pen) in 3 experimental net pens (∅ = 2.5 m, h = 2 m). The by-catch anchovy used as wet feed was provided by the local fishermen and immediately frozen after landings at – 20 °C. Frozen anchovy was thawed and sliced (around 1 cm long) before they were fed to the fish. Commercial trout diet was purchased from the market (Rainbow trout, Ø = 4.5 mm, Abalioglu). The proximate compositions of the experimental diets are shown in Table 1. For feeding trial, each experimental group was fed only pellet (commercial diet), only raw anchovy and raw anchovy/pellet combination. Three cages were assigned at random for each feeding regime. Each group was hand-fed to near satiation twice a day in the morning and evening. The feeding order of the pellet and raw anchovy was shifted every following day in the group fed anchovy/pellet combination. The feeding trial lasted for 58 days. The amount of feed delivered and the mortalities were recorded daily. All fish from each pen was weighed individually at the beginning and at the end of the experiment after anaesthetized with benzocain solution (5 % w/v). The mean sea water temperature was recorded beneath one meter of the surface with digital thermometer in the morning and evening was ranged within 7.3 and 10.4 °C (mean 8.3 ± 2.3°C) during the experiment. Crude protein and crude lipid in samples were determined by Kjeldahl method and by ether extraction method, respectively. Ash and moisture contents of the diets were determined by Association of Official Analytical Chemistry (AOAC, 1995) method. Statistical significance of differences among measured parameters was subjected to one way analysis of variance (package super- ANOVA, Abacus Concepts, Berkeley, California, USA). If significant (P<0.05) differences were found in the one-way ANOVA test, Duncan`s new multiple range test (package super-ANOVA, Abacus Concepts, Berkeley, California, USA) was used to rank the groups. The growth response and related parameters of the rainbow trout are presented in Table 2. 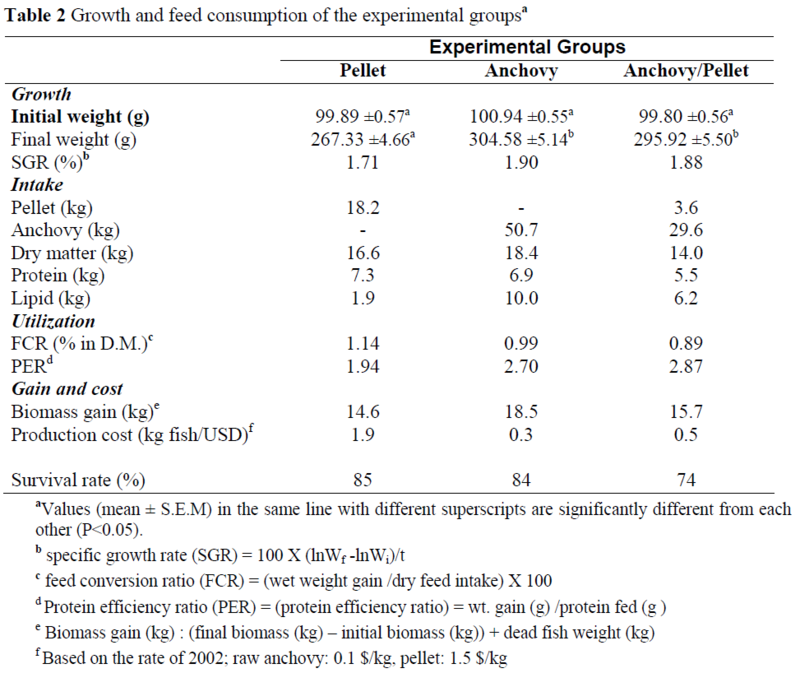 Final mean body weight of rainbow trout fed pellet was significantly lower than those fed anchovy and anchovy/pellet groups. However, no difference was found between the groups fed anchovy and anchovy/pellet. The highest specific growth rate (SGR) was obtained from the group fed anchovy (1.90), and this value was followed by the groups fed anchovy/pellet (1.88) and pellet (1.71). In dry weight basis, the lowest feed intake and the most efficient feed conversion ratio (FCR) were obtained from the group fed anchovy/ pellet. Total protein intake was almost the same in all experimental groups, and lipid intake was the highest for fish fed anchovy (Table 2). Protein efficiency ratio (PER) was highest (2.87) for fish fed anchovy/pellet combination and lowest (1.94) for those fed only pellet. Based on the economical aspects, the lowest production cost (0.3 $/kg fish) per unit of biomass gain was obtained from the group fed raw anchovy. All groups showed high survival over 58 days. Hepatosomatic index and viscerasomatic index of the fish fed anchovy were significantly higher than those of the other groups (Table 3). However, no significant effect on cardiosomatic index and splenosomatic index of experimental fish was observed. The final mean body weight and SGR of the fish fed anchovy and anchovy/pellet were significantly (P<0.05) higher than the fish fed pellet. 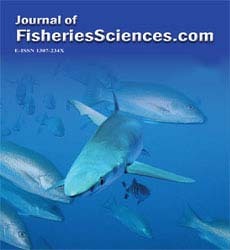 Although mean water temperature during the experimental period was quite low (8.3 ± 2.3°C) for rainbow trout, anchovy as wet feed was well accepted than the pellet by the fish since fish receiving wet feed had a better appetite, particularly during the periods of low water temperature (Gabrielsen and Austreng, 1998). Nutritionally, in dry matter basis, raw anchovy contains more lipid than the pellet, revealing that the lipid-originated energy content of anchovy is higher than the pellet. Gross energy concentration of lipid is the highest among the other bioenergetics (approximately 9.45 kcal/g) (Koshio et al., 1993). The fish consumed raw anchovy with or without pellet digested more lipids, and showed superior growth than the fish fed only pellet. It is well known that rainbow trout has a higher capability to use lipid as energy source, and protein could be spared by lipid. In the present study, consumed protein could be used for only growth by the fish receiving partly or only raw anchovy because of higher lipid intake. Growth retardation on the group fed only pellet may be explained by the lower lipid intake. The use of anchovy as wet feed had positive effect on FCR. Depending on the source and dry matter content of the raw material, FCR values of wet feeds are generally higher than that of the pellets and vary from 2.9 to 8. For instance, seabass fed minced fish with 2% animal feed supplement showed a FCR of 2.89-4.89 (Kosutarak., 1981), whereas those given pelleted diets showed a FCR of 0.9-1.53 (Tucker et al., 1988; Sakaras et al., 1988; Wong and Chou, 1989). However, FCR values of the fish fed anchovy and anchovy/pellet were higher than the fish fed pellet since the values of the present study were evaluated on the dry weight basis. PER was relatively higher and protein intake was lower in fish fed anchovy and anchovy/ pellet than the fish fed only pellet. The groups fed anchovy and anchovy/pellet also consumed relatively low amount of protein than the fish fed only pellet. Low dietary protein is efficiently utilized by fish for protein synthesis, and PER decreases with increasing dietary protein level (Ogino and Saito, 1970; Ogino et al., 1976; Steffens, 1981). For instance PER of fish tended to increase with the high energy diets containing high lipid at all protein levels in masu salmon (Lee and Kim, 2001). Similar results suggesting a compensatory mechanism (Berger and Halver, 1987) have also been reported for some other fish species (Garling and Wilson, 1976; Chen and Lee, 1985; Parazo, 1990; Santiago and Laron, 1991). With respect to economical and resource aspects of using raw anchovy, the feed used for 1 kg fish production was different in the groups. Although the price of the anchovy is subjected to some variations depends on the landing amounts per year, it is around 0.1 $/ kg while pellet is 1.5 $ / kg. The cost of producing 1 kg of fish with dry feed was 1.9 $ and it was 0.3 $ and 0.5 $ with the raw anchovy and anchovy/ pellet respectively. The HIS and VSI values demonstrated that excess lipid beyond utilizable limits were stored in the liver and internal organs. Fish tend to increase their lipid deposition with increasing fat levels in diets (Kasutarak, 1987; Sæther and Jobling, 2001; Lee et al., 2002). The higher HSI and VIS of the fish fed only anchovy than those fed pellet and anchovy/ pellet could be attributed to higher lipid intake. Compared to the commercial diet, no measurable negative effect on growth of the fish fed anchovy and anchovy/pellet was detected. However, retarted growth rate of rainbow trout and sea bream fed raw anchovy was demonstrated by Ishihara and Yasuda (1974). They found that thiaminase enzym present on the anchovy could block the utilization from thiamine (vitamine B1) on the long term period, hence growth of fish was negatively effected. Considering the initial weight and duration of the present study, there need to be further clarification to identify possible long-term effects of anchovy as a wet feed on growth and proximate composition of different size of rainbow trout. In conclusion, short term feeding with anchovy as wet feed showed possitive effect on growth and economic aspects of the culture of rainbow trout during the winter season. However, as a valuable protein source for human consumption, anchovy must not primarily be considered as a feed in aquaculture. Therefore, by-catch anchovy which is not possible to use for human consumption must be evaluated as a supplemental diet to the pellet on rainbow trout, particularly over a period of low water temperature in the Black Sea. Alam, MS., Teshima, S., Koshio S., Uyan, O., and Ishikawa, M., (2003). Effects of dietary protein and lipid levels on growth and body composition of juvenile, Paralichthys olivaceus, fed diets containing intact proteins or crystalline amino acids, J. of Appl. Aquacult., 14: 115-131. Anonymous, (1998). Su Ürünleri Istatistikleri. T.C. Basbakanlik Devlet Istatistikleri Enstitüsü, Yayin No: 2154. Aral, O., Agiragaç, C. and Yigit, M., (1999). Gökkusagi alabaliklarinin (Oncorhynchus mykiss W. 1792) beslenmesinde midye eti kullanimina iliskin bir arastirma, Turk. J. Vet. Anim. Sci., 23: 23-27. Berger, A. and Halver, J.E., (1987). Effect of dietary protein, lipid and carbohydrate content on the growth, feed efficiency and carcass composition of striped bass, Morone saratilis (Walbaum) fingerlings, Aquacult. Fish. Manage., 18: 345-356. Berge, G.M. and Austreng, E., (1989). Blue mussel in feed for rainbow trout, Aquaculture, 81: 79–90. Chen, J.C. and Lee, K.K., (1985). Effects of dietary protein and energy levels on growth and body composition of red tilapia (Oreochromis sp.). In: R. Day and T.L. Richards (Editors), Proceedings of the International Warm Water Aquaculture Conference (Finfish), Brigham Young University, Hawaii, 337-380. Çelikkale, M.S., (1994). Içsu Baliklari Yetistiriciligi. KTÜ. Sür.Den.Bil.Fak. Cilt 1, K.T.Ü. Basimevi, Trabzon. Edwards, D.J., (1978). Salmon and trout farming in Norway. British Library CIP Data. Printed in Great Britain by Page Bros ( Norwich ) Ltd.
Gabrielsen, B.O. and Austreng, E., (1998). Growth, product quality and immune status of Atlantic salmon, Salmo salar L., fed wet feed with alginate, Aquacult. Res., 29: 397-401. Garling, D.L., Jr. and Wilson, R.P., (1976). Optimum protein to energy ratio for channel catfish fingerlings, Ictalurus punctatus, J. Nutr., 106: 1368-1375. Grave, H., Schultz, A. and Thielen, R. Van, (1979). The Influence of blue mussel, Mytilus edulis, and Krill, Euphausia superba, on growth and proximate composition of rainbow trout, Salmo gairdneri, Finfish Nutr. Fish Feed Tech., 1: 575-593. Hewett, S.W. and Kraft, C.E., (1993). The relationship between growth and consumption comparisons across fish populations, Trans. Am. Fish. Soc., 122: 814–821. Ishihara, T. and Yasuda, M., (1974). Studies on Thiaminase I in Marine Fish-IV. Effect of thiamine on growth of rainbow trout and sea bream fed anchovy, Bull. Jap. Soc. Sci. Fish., 40 (7): 671-674. Kosutarak, P., (1981). Effect of the protein level in formula diet for seabass, Lates calcarifer, Report of Thailand and Japan Joint Aquaculture Research Project, Songkhla, Thailand, April 1981-March 1984. JICA, Tokyo, pp. 93-96. Koshio S., Teshima S., Kanazawa, A., and Watase T., (1993). The effects of dietary protein content on growth, digestion efficiency and nitrogen excretion of juvenile kuruma prawns, Penaeus japonicus, Aquaculture, 113: 101-114. Lee S.M., Park C.S. and Bang C., (2002). Dietary protein requirement of young Japanese flounder Paralichthys olivaceus fed isocaloric diets, Fish. Sci., 68: 158- 164. Lee, S.M. and Kim, K.D., (2001), Effects of dietary protein and energy levels on the growth, protein utilization and body composition of juvenile masu salmon (Oncorhynchus masou Brevoort), Aquacult. Res., 32 (Supp. 1): 39-45. Lim,C. and Dominy, W., (1990). Evaluation of soybean meal as a replacement in diets for shrimps (Penaeus vannamei), Aquaculture, 86: 401-407. Ogino C. and Saito K., (1970). Protein nutrition in fish. I. The utilization of dietary protein by young carp, Bull. Jap. Soc. Sci. Fish., 36: 250-254. Ogino C., Chiou J.Y. and Takeuchi T., (1976). Protein nutrition in fish. VI. Effects of dietary energy sources on the utilization of proteins by rainbow trout and carp, Bull. Jap. Soc. Sci. Fish., 42: 213-218. Parazo, M., (1990). Effect of dietary protein and energy level on growth, protein utilization and carcass composition of rabbitfish, Siganus guttatus, Aquaculture, 86: 41-49. Sæther B.S. and Jobling M., (2001). Fat content in turbot feed: influence on feed intake, growth and body composition, Aquacult. Res., 32 (6): 451-458. Sakaras, W.M., Boonyamtpalin, M., Unprasert, N. and Kumpang, P., (1988). Optimum dietary protein/energy ratio in seabass feed, I. Technical Paper No. 7, Rayong brackishwater Fisheries Station, Thailand, 20 pp. Santiago, C. and Laron, M., (1991). Growth response and carcass composition of red tilapia fry fed diets with varying protein and protein to energy ratios. In: S. De Silva (Editor), Proceedings of the Fourth Asian Fish Nutrition Workshop, Special Publication, Asian Fisheries Society, Philippines, 55-62. Steffens W., (1981). Protein utilization of rainbow trout (Salmo gairdneri) and carp (Cyprinus carpio): a brief review, Aquaculture, 23: 337-345. Talbot, C., Corneillie, S. and Korsoen, O., (1999). Pattern of feed intake in four species of fish under commercial farming conditions: implications for feeding management, Aquacult. Res., 30: 509-518. Tucker, J., MacKinnon, M., Russell, D., O’Brien, J. and Cazzola, E., (1988). Growth of juvenile barramundi (Lates calcarifer) on dry feeds, Prog. Fish Cult., 50: 81-85. Wong, F.J. and Chou, R., (1989). Dietary protein requirement of early grow-out sea bass (Lates calcarifer, Bloch) and some observations on the performance of two practical formulated feeds, Singapore J. Pri. Ind., 17(2): 98-111.